This particular version of this photograph – featuring Xu Yun at the Yang Quan Monastery (Gu Shan) – is taken from page 12 of the 1988 Element Books edition of Charles Luk’s English translation of the Chinese biography entitled ‘Empty Cloud The Autobiography of a Chinese Zen Master Xu Yun’ (edited by Richard Hunn). The photograph originates from the Buddhist Library of China and is thought to show Master Miao Lian, from whom Xu Yun received full ordination in 1859/60 (aged 20) at Yang Quan, together with the Dharma-names Gu Yan, Yan Che, and De Qing. There is no date associated with this photograph, but Xu Yun’s hair is beginning to turn grey and both men appear to be middle-aged – that is between 40 and 60 years of age. This means that this picture could have been taken sometime between 20 to 40 years after their initial meeting in 1859/60, that is between the years 1879/80 and 1899/1900. The detail that this might be Master Miao Lian stems from the information provided to Charles Luk by the Buddhist Library of China. Where my illness causes others so much trouble. Filled with shame and horror at all my misfortunes. Achieved Reality supreme after hearing a word or two. The third example is a beautiful example of the development of what might be referred to as Xu Yun iconology, complete with glowing halo. The unknown artist has produced an exact copy of the position of the hands and use of the mala. 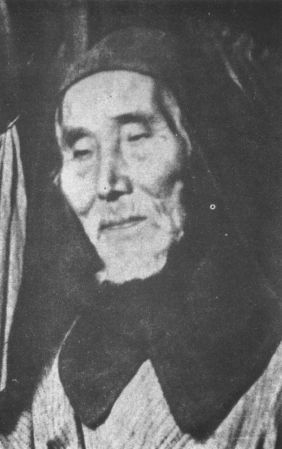 On page 130 of the 1988 Element Books edition of Charles Luk’s English translation of the Chinese biography entitled ‘Empty Cloud The Autobiography of a Chinese Zen Master Xu Yun’ (edited by Richard Hunn) it states that this picture was taken of Master Xu Yun in his 113thyear, (1952/53) at the Three Buddhas Temple, Wuchang. Unlike the majority of photographs in this book, it is not accredited to the Buddhist Library of China, and appears to have been a personal possession of Charles Luk (1898-1978). This picture was taken in 1959, Master Xu Yun’s 120th year of life. At this point in his long life he had nearly completed two full 60 year cycles of the Chinese astrological system. On page 155 of the 1988 Element Books edition of Charles Luk’s English translation of the Chinese biography entitled ‘Empty Cloud The Autobiography of a Chinese Zen Master Xu Yun’ (edited by Richard Hunn) the caption reads that this picture was taken on Mount Yun Ju, and the Zhen Ru Monastery, the last area to be re-built by Xu Yun in his life time. Charles Luk attributes this picture to the Buddhist Library of China. This photograph was also used by Charles Luk in his 1964 book entitled ‘The Secrets of Chinese Meditation’, (between pages 48 – 49), with the caption reading ‘The late Ch’an Master Hsu Yun in 1959’. Here, Master Xu Yun sits on the rocky ground without a cushion, wearing a patchwork robe and moving the mala through his fingers. The mind, breath, and touch of mala all emanate equally from the empty mind ground and never deviate from the ‘host in host’ position of the Cao Dong School of Ch’an. Ch’an and Zen practitioners should take note of the lack of modern comfort and realise that all is the empty mind ground. An iconic photograph of Master Xu Yun taken in 1957/58 - when he was in his 118th year of life. This picture was taken at the Zhen Ru Monastery on Yun Ju Mountain in Jiangxi province, Southeast China. He continued to organise the repair of a 6 mile track from Zhang-gong Jetty to the monastery, and to reclaim waste-land for monastic use. However, at this time local officials confiscated the cultivated monastic land and threw Master Xu Yun out of the cowshed he chose to live within. The Central Government in Beijing intervened and the local authority officials withdrew from the area leaving Xu Yun free to return to his cowshed. Master Xu Yun always refused even the most meagre of comforts in his daily life. On page 114 of the 1988 Element Books edition of Charles Luk’s English translation of the Chinese biography entitled ‘Empty Cloud The Autobiography of a Chinese Zen Master Xu Yun’ (edited by Richard Hunn) this picture appears confirming the date and place, and that it was supplied to Charles Luk by the Buddhist Library of China. 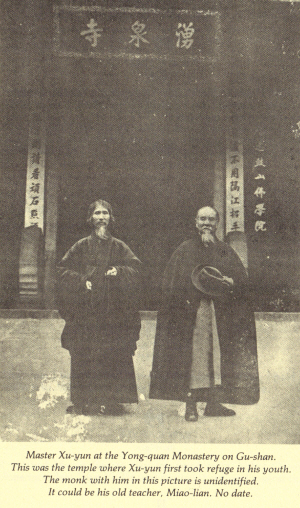 From the type of robe (black tie-across), and length of hair and beard, this picture appears to show Master Xu Yun at the Three Buddhas Temple in Wuchang, Hubei province (1952/53 – in his 113th year). His left hand can be clearly seen to be missing its ring-finger. In his 58th year of life (1897/98), Master Xu Yun travelled to the Ashoka Monastery situated in Zhejiang province, with the intention of burning-off his left ring-finger out of respect for his mother who died giving birth to him. Xu Yun never new his mother, but had only seen a photograph of her. At the Ashoka Monastery he performed three thousand prostrations per day toward the shrine containing the Buddha’s relics. One night, whilst sat in Ch’an meditation, Xu Yun saw a dazzling bright-green dragon that took him (on its back) high into the sky, and into a land of paradise. There, he witnessed his mother sat in the room of a palace – he called to her to get on the dragon’s back and fly to the Pure Land! When the dragon brought him back, he decided the time had come to burn-off his finger and dedicate the merit of this sacrifice to his mother. The above picture shows Master Xu Yun during his time of recovery from a fearful beating that he had received earlier at the hands of local officials at Zhen Ru Monastery, Yun Men Mountain. This picture appears throughout the Chinese language internet in a number of versions, usually with one or other of those represented (with Xu Yun) edited out for different reasons. In this photograph, Master Xu Yun is in his 109th year of life and the year is 1948/49. The person to the right of Xu Yun is the young Dharma Master Hsuan Hua – who would go one to be a famous Ch’an Master in the West – and to Xu Yun’s left is the American lady Ananda Jennings. She had previously worked for three years at the League of Nations, but her experience suggested to her that true world peace could only be achieved within each individual. She was once a Theosophist who had transitioned into Buddhism; she had heard that Xu Yun was a living saint and had travelled to China just to see him. She received ordination under Xu Yun and this picture is believed to be taken at Nan Hua Temple, Guangdong province. This picture often appears in Chinese sources in the edited format seen in the second version – with the other people and background airbrushed out. Curiously the flowers remain. In this picture Master Xu Yun is in his 113th year of life.